I’m almost scared to write another article on Mexican food since there are so many good options around Jacksonville, but a newbie in my area deserves some recognition. 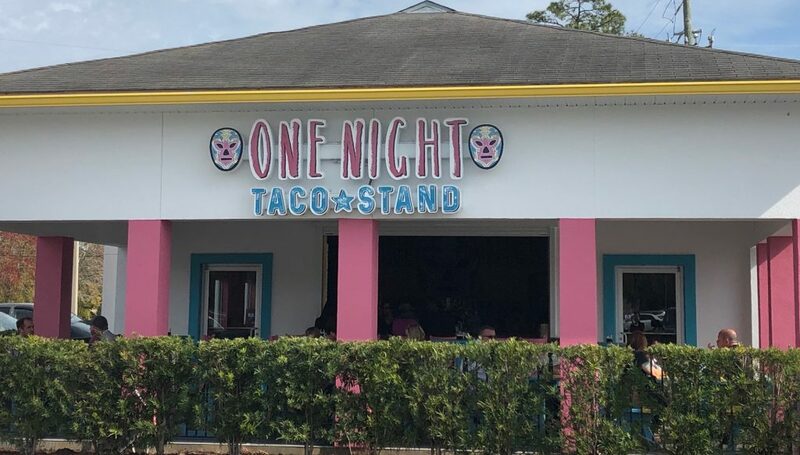 One Night Taco Stand is a welcomed addition to Mandarin that you should be sure to visit! In the short time we have lived in Jacksonville, I think this building has been at least 3 different restaurants. The location seems like a prime spot, so I am not sure why it has changed so many times. 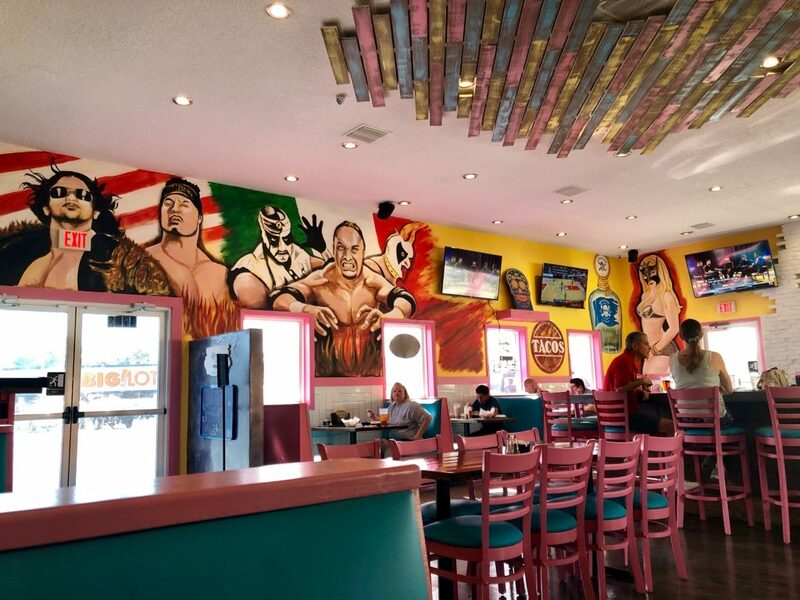 One Night Taco Stand gave the building a facelift, using bright colors and painting fun murals throughout the inside. When the weather is nice, they can open the glass garage door and there is plenty of outdoor seating on their patio. They also have a full bar and lots of TVs, making it a potential sports hot spot, especially with happy hour daily from 2-6pm. The extensive menu has something for every Mexican food lover, including a variety of taco/specialty taco options. They offer Taco Tuesday deals if you want to save a little money and try a mix. We started with a small order of their guacamole ($4.50) to go with our chips and homemade salsa. The chips were still warm, and the salsa had a good spice and tang to it. The guacamole was fresh and chunky, so we were off to a good start. For the main course we ordered two of their tacos, Pastor ($3.50) and a Mr. Potato ($3.75), a carnitas huarache ($5.99), and a Baja salad ($9.99). When the food arrived, it was hard to decide what to dig in to first. The tacos were served in traditional fashion but have the option to make it “Americanos style” with lettuce, sour cream, cheese and tomatoes for 25 cents per taco (50 cents per order of 3). The crisp pastor meat had a beautiful bright red color from the chilis. The richness of the meat and the sweet pineapple went well with the fresh cilantro and onions sprinkled on top. Mr. Potato is a breakfast taco with chorizo, eggs, and queso fresco. The meat was full-flavored but not spicy, the eggs were light and fluffy, and the cheese was creamy and salty. 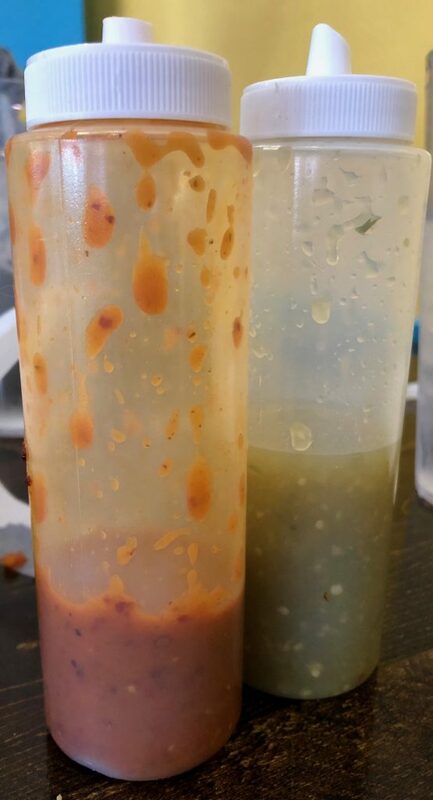 They have homemade green and red sauce so make sure to ask for some. 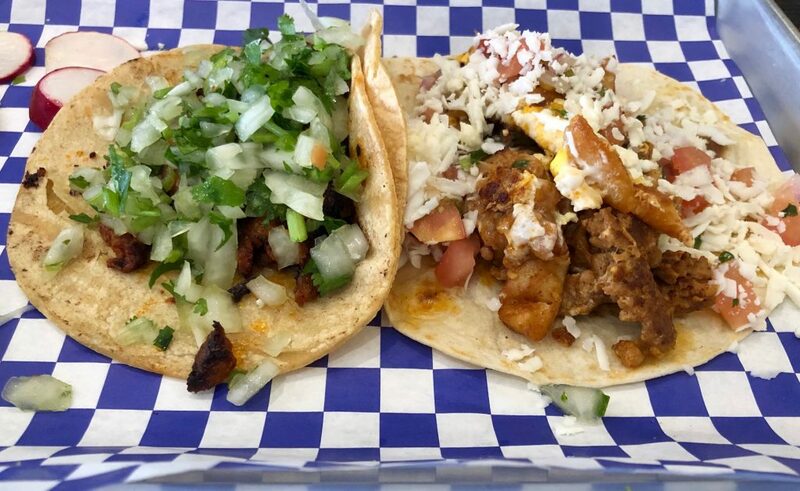 Both are delicious, but they are spicy, so I recommend a taste test before basting the entire taco in either sauce. Since we went for lunch, I wanted to try something a little lighter and the Baja salad hit the spot. There was a ton of chicken, which you could tell was freshly cooked. At the bottom of the salad rice and beans were hiding. If you have not put rice in a salad before, try it- the heat mixes really well with the crisp lettuce and cool dressing (their cilantro dressing was great). To offset any health value that the salad provided, we dug in to the huarache. I was unfamiliar with huaraches; google solved that problem. The name huarache comes from the shape of the masa base which is oblong like the sandals with the same name. 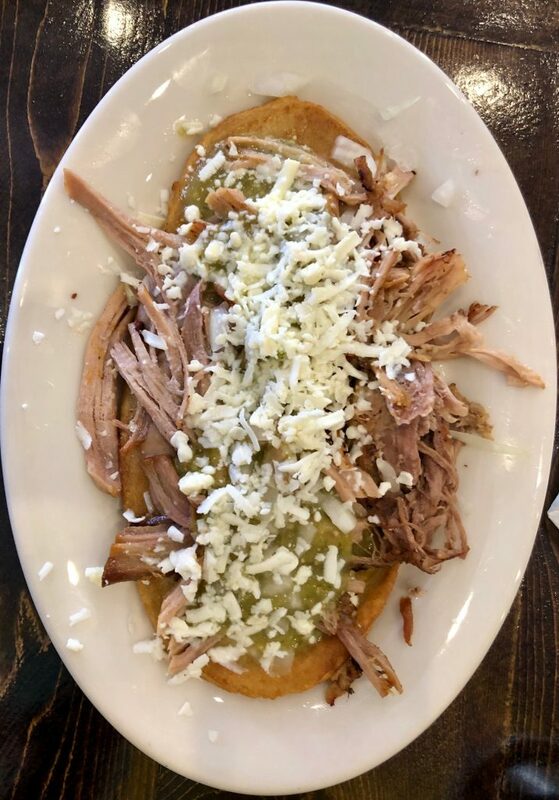 It was topped with beans, onions, queso fresco, carnitas, and green sauce. Since this was my first time having the dish, I have nothing to compare it to, but I thought the base could have been a little crispier. Other than that, it was quite delicious. The carnitas were tender and plentiful. Warm tomatillo sauce added good acid to balance the pork. 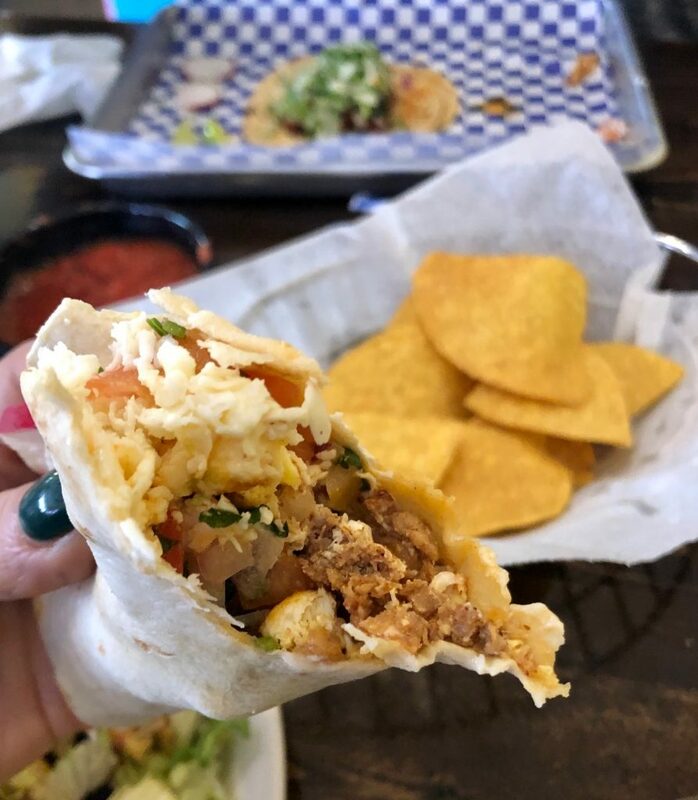 The large menu at One Night Taco Stand offers something for every type of Mexican food lover- from more traditional fare like huaraches to copious taco choices to lighter options. The space is inviting and visually exciting, plus the mixed use with the garage door is great for our gorgeous Northeast Florida spring and fall weather. I hope One Night Taco Stand is here for years to come and I look forward to trying even more of their delicious food! 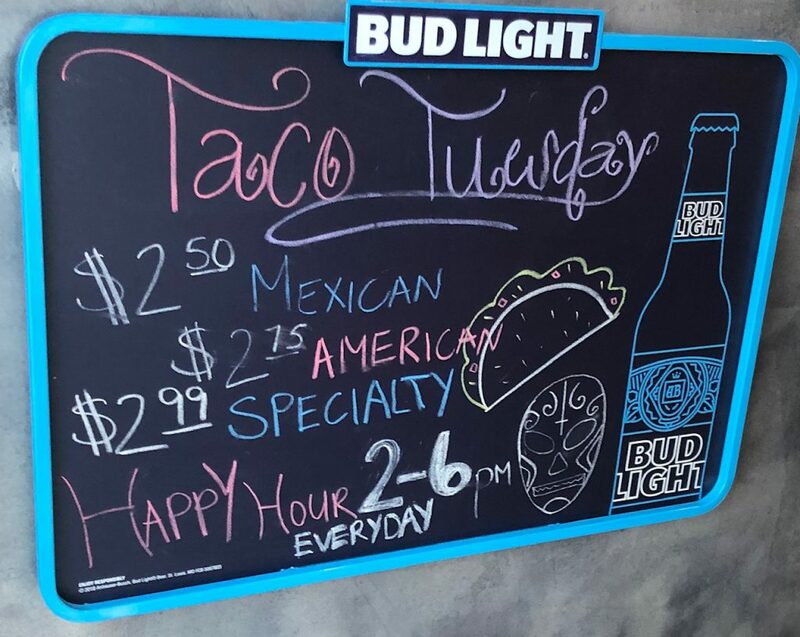 Tagged Alcohol Serving, Casual, Dinner, Full Bar, good for families, Good for Kids, lunch, mexican, Serves Alcohol, street tacos, tacos. Bookmark the permalink.